The cap makes a satisfying click as you open the balm and as you swipe a layer of it onto your lips, you feel a tingling sensation as the moisture returns to your dry lips. Chapstick is the reason you have soft lips but what if it is also the reason you have dry lips? Chapstick works by sealing your lips to prevent the loss of moisture contrary to the common belief of adding moisture. On cold or dry days when moisture would typically evaporate, the wax or petrolatum acts as a barrier, leaving your lips moist and soft, according to 5 Things You Never Knew about Chapstick. However, applying balm actually stops the body from generating natural moisture around the lips with ingredients like phenol, menthol and salicylic acid: that causes the tingling. Carmex, for example, has both menthol and camphor. It also results in irritation and works as an exfoliant to remove the outer layers of skin, according to 7 Signs Your Lip Balm Use is Just a Bad Habit. With less protection, your lips are more vulnerable to environmental factors, making you apply more Chapstick and repeating the cycle. Peppermint. Strawberry. Cotton candy. So many flavors and so many more reasons why chapstick is bad for you. The scents and flavorings contain chemicals that irritate your skin and trigger allergies. Flavored balms, like mint or cinnamon, are especially irritating. That’s not it. You put on chapstick several times a day; you have one everywhere and you spend a lot of money on buying new ones. While the actual ingredients in chapstick aren’t addictive, you can be psychologically addicted to putting on chapstick and/or the feeling of smooth lips. When it is first put on, it feels like it’s just sitting on your dry lips; what is actually happening is that the layers of your mouth are actually dying and drying out instead of making new cells, according to a Spoon University article. After the wax is worn off, you apply more to keep your lips soft because your lips can’t replenish the cells. Don’t forget the chemicals working their magic too! So, what can you do? 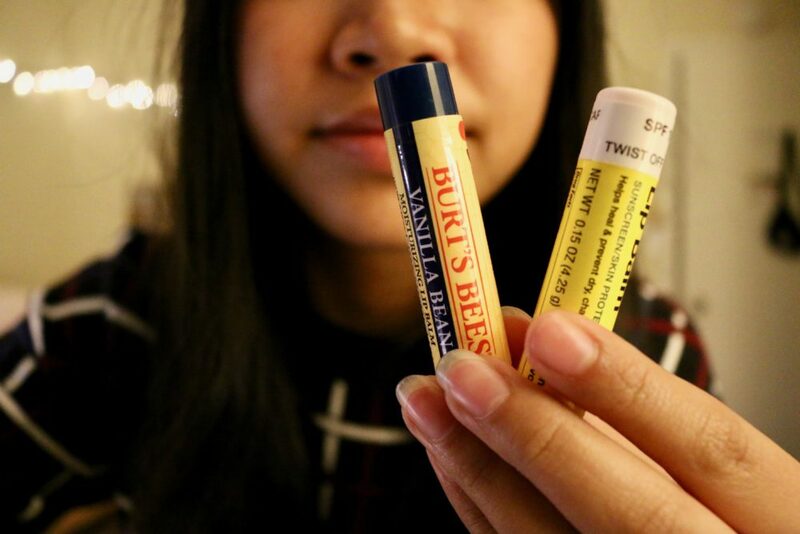 You can still use chapstick like petroleum-based jelly products but look out for ingredients like beeswax, lanolin, salicylic acids and benzocaine. Some people are allergic to these even though they don’t even know, according to a Shape article. Honey and other alternatives work as easy homemade lip balms. Try using chapstick with SPF, taking fish pills and drinking water. What shouldn’t you do if you have chapped lips? It is an instinct to lick your lips and while your lips are moistened for a moment, your saliva dries your skin out even more. Picking at dead skin can cause a cold sore, bleeding and infections. Lipsticks have the same effects as chapstick so that’s not an option either. Check the expiration dates on your lip products too as old ones can grow bacteria. While chapstick may feel like the “balm,” it is actually bad for you. The next time you lose your chapstick, maybe it’s God telling you to stop, but, if you decide to chap-stick with it, just remember to not overuse it!